Episode Theme: Take Time to fully understand a situation before making a judgment about it. 1. Proverbs 18:2 says that fools would rather give their own opinions. What might be wrong with telling other people what you think? Is it better to have understanding? 2. In Daniel 6, we read about Daniel, who was one of the governors in the kingdom of Babylon. King Darius liked him and planned to put him in charge of all the other governors. These men were jealous of Daniel and plotted to get rid of him. They told Darius that only he was great and worthy of worship. They persuaded Darius to sign a law saying that everybody had to worship him. Darius was flattered and signed the law. When the governors told Darius that Daniel was worshiping God and not him, Darius found out his mistake. He should have waited until he had all the facts. Instead, he had to throw Daniel in the pit of lions. God protected Daniel, and the governors who had tricked Darius ended up being lion’s food. King Darius learned that it’s always better to have understanding than to be a fool. As you listen to this episode, think about how important it is to know the facts before giving your opinion. 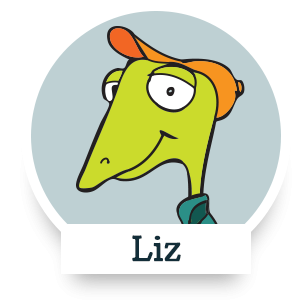 In this episode, Liz and Grandpa Anole find that things aren’t always what they seem. Everyone has opinions—about sports teams, about classes in school, or about the latest movie. Usually, those opinions are harmless. But when your opinions are about other people, they can get you in a lot of trouble. Before you say anything about someone else, you should be very careful to make sure you have all the facts. Even then, it’s almost always best to keep quiet. 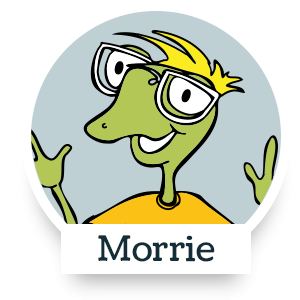 Sites like Facebook, Snapchat, and Yik Yak make it easy for you to share your opinions with a lot of people in a very short time. But they can also make it easy for you to become a fool (Proverbs 12:23). Want to dig deeper and learn more about how important it is to keep your opinions to yourself? Check out Proverbs 10:14, Proverbs 13:16, and James 3:5-6. What did Grandpa Anole name his truck? Why was Bruno in prison? He attempted to steal a painting. 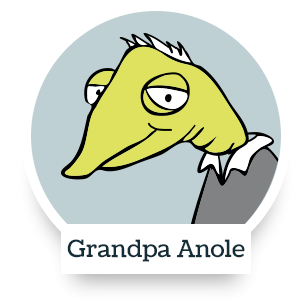 What were the buttons on Grandpa Anole’s chair for? What was Bruno’s nickname for his daughter Brigette? Who did Bruno want to get revenge on? On a sheet of paper or piece of cardboard, write the words “Am I wise, or am I a fool?” Hang it in your room where you will read it every morning. If you are on social media on your computer, hang it where you can see it while you’re online. Before you post any opinion, look at the sign and ask yourself, “Do I have all the facts?” “Can what I post hurt someone else?” “Will what I say make me look like a fool?